Start Are We Heading for the Colonization of the Stars? The question of whether we are alone in the universe never goes away, and not only in astronomy. Search programs such as SETI have consistently been listening for signs of alien life using powerful radio telescopes. We have also been proactive, and used the same means to send out our own messages beyond the interstellar seas. There are “messages in a bottle” floating through space in the form of the texts and images on the spacecrafts Pioneer 10 and 11 and Voyager 1 and 2. These initiatives are not devoid of controversy. On the one hand, it is questionable that any extraterrestrial civilization –should one exist– would really be able to understand the content of these messages. Consider for example that there are still languages from antiquity that have yet to be deciphered, as is the case of Etruscan or Linear A, the writing of the Minoan civilization of Crete. It will be even more complex for beings with no experience of humans, and considering the limited information-carrying capacity of the messages. What’s more, from another perspective –and given our track record in meetings between cultures with very different levels of development–, this hypothetical interaction does not on the face of it suggest a very hopeful outcome: the big fish ends up devouring the small one. Fortunately the immense distances between the stars represent –in principle– insurmountable obstacles. 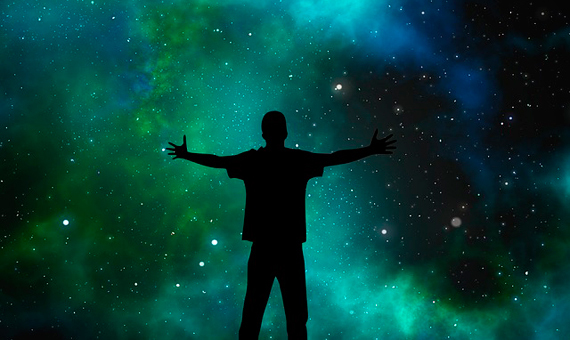 However, involuntarily, we human beings are shouting out “We’re here!” to the whole universe. We’re doing so by emitting radio waves, mainly from our multiple television channels. Given that these signals travel at the speed of light, we have already notified the neighborhood of our existence and have also provided vast amounts of information. This is a sphere with a radius of about 80 light years in which there are a large number of stars, and in fact we already know that a significant number of these stars have planets. In any case, this is only a tiny portion of the galaxy, whose diameter is over one thousand times greater. Another way in which the Earth can inadvertently be detected is through the effect our planet has on the light emitted by the Sun. In fact, seen from another star, our Sun undergoes the minor regular dimming of its light when the Earth crosses its face in a phenomenon similar to an eclipse. This means that at a particular time, potential observers may find themselves aligned with our planet and our Sun. In fact, we currently use this method to describe exoplanetary systems. And there is a very active campaign to find and characterize all the systems that could be within the so-called habitability zone, in which water could be liquid. There are already more than one thousand planets confirmed, and several thousand more potential candidates. The same technique can be used to study exoplanetary atmospheres, and –we hope– be able to verify whether there is biological activity. Recently, the researchers David Kipping and Alex Teachey have proposed a method to avoid possible detection. The technique consists of using light pulses emitted by an extremely powerful laser to prevent the variations from the Sun’s light from being measured. This would be something like covering ourselves with a blanket –a layer that would make us invisible. Although possibly excessive, the study reopened the debate on the advisability of continuing to launch messages into space, due to the improbability of their being received and deciphered. Almost simultaneously, a group of leading philanthropists, scientists and technology experts have launched an initiative to “settle” the stars, at least the nearest ones. This marks a shift in space exploration strategy, with the use of microtechnology and scale economies. The multimillionaires Yuri Milner (Digital Sky Technologies) and Mark Zuckerberg (Facebook), along with researchers of the stature of Stephen Hawking, have created, through the Breakthrough Initiatives organization, a fund of 100 million dollars to develop a pioneer project aimed at sending up credit-card sized interstellar spacecrafts. The initiative, known as Starshot, forms part of a strategy designed to find an answer to one pressing question: are we alone in the universe? Starshot poses numerous challenges, but it also opens up infinite opportunities in some very diverse fields. Our planet –and therefore our civilization– is under threat from humankind itself and from the hostile environment in which we move: meteorites or supernovas could wipe us out and leave no trace. In fact, several astrophysical events have caused mass extinctions in the past, as was the case of the extinction of the dinosaurs in the Cretaceous-Tertiary era 65 million years ago. Following in the footsteps of the much-missed popularizer Carl Sagan, Hawkins has proposed the search for a new home beyond our own solar system. To send nanocrafts weighing just a few grams to the nearest stars –which include Alfa Centauri, the nearest star similar to our own Sun– requires the development of new technologies: laser ray beamers located on Earth with power equivalent to 100 nuclear plants, photonic sails on spacecrafts, shields against cosmic rays and interstellar dust particles, navigation systems, microelectronics and miniscule cameras, and communications systems to send the information back to Earth, among others. This part of the program will last two or three decades. The journey will take twenty years, with the nanocrafts moving at 20% of the speed of light. The primary aim is to determine whether there are planets like Earth out there; and the ultimate aim is to settle them. Breakthrough has 100 million dollars to embark on the first steps, although the overall tab will be way over 10 billion and require international cooperation. The sponsoring group, headed by Pete Worden, ex-director of NASA’s Ames Research Center, includes a constellation of high impact figures from the worlds of research and culture. The Starshot project not only seeks to answer one of the most important questions humanity has asked itself from time immemorial, namely: are we alone in the cosmos? It also sets out to find new habitats so we can expand and continue the emigration that tens of thousands of years ago took us out of the African savannah. But now, the destination is the stars. The goal is to ensure our survival as a species. Numerous new technologies will be necessary, and this will have an incalculable effect on our daily lives –even before the project actually comes anywhere near the possibility of an actual launch. Everything from the production and storage of energy, and the miniaturization of electronics, through to new systems of communication. The project also raises several key points, such as the willingness of foundations and philanthropists to take on challenges that involve long-term planning, and the existence of visionaries who are prepared to finance them. This is all in stark contrast with Spanish society, with the lack of philanthropic projects by its millionaires, and the attitude of the various governments who are incapable of thinking even in the medium term and provide financing for high-risk projects. But probably the most important point is the focus on the need to think about the future and our survival. Some, however, might consider that the proposal by Stephen Hawking does not take the most effective route. In fact, although the universe is a fairly unfriendly place, the main danger to mankind lies in ourselves (“Homo homini lupus est”, or “Man is wolf to man”). We should look for the answer here and now, with better management of resources and relations between the cultures. We can also continue to learn from history. At the start of the 17th century, Japan closed its borders, effectively eliminating the influence of the West and possibly staving off the expansion that had already occurred in Southeast Asia. This is the policy of concealment proposed by Kipping and Teachey, among others. In 1853 the American commodore Perry used military might to put an end to that strategy. Although he found Japan to be technologically backward, the policy of the governors of the day was to preserve the local culture, which together with the subsequent investment in knowledge and training in the Meiji dynasty, and the control of the information flow, were instrumental in helping the Japanese to flourish and become a part of a globalized world in equal conditions. This is a lesson that would be worth replicating in the hypothetical case that this interstellar contact ever came about. Meanwhile, let’s sit back and enjoy the stars, albeit from the darkness of a garden, and continue dreaming. But we should also appreciate and safeguard all the wonders of this garden of Eden –our home, this small planet called Earth.